As a board certified surgeon, I know that there are many ways to get surgeries done and every surgeon has their own developed tips and tricks over years of experience. It’s always good to learn from others – especially in other parts of the world. 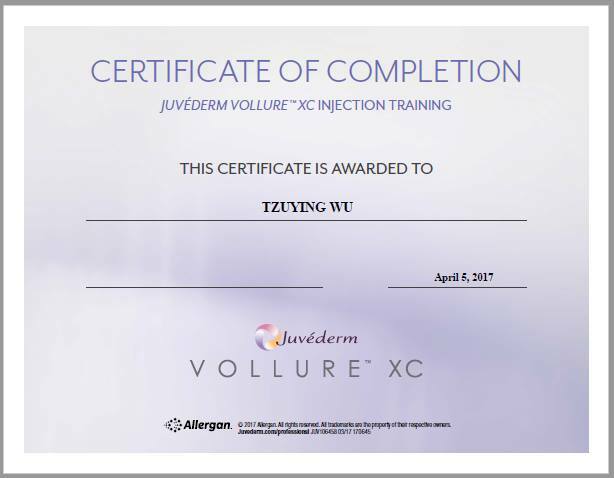 In the past few weeks, I’ve participated in two national-type training programs for Botox and Juvederm fillers. I especially enjoyed watching other great injectors approach lip augmentation challenges. Later today I am going to San Francisco to attend an international training program for Botox and Fillers/Juvederm. The speaker is from Australia. Here’s an interesting certificate that I got after one of the training programs – they sent it to me via email, but they used the bosses’ name on our practice. Well, it’s the plastic surgeon wife, but I did the training program. It’s worth mentioning that her full name is Dr. Tzuying Tammy Wu. And you can visit her plastic surgery webpage here: www.SurgeryToday.com. And you can visit my Botox webpage here.